Overcome your fear of oyster sauce with this Vietnamese chicken treat! When I first started cooking, I ordered a cookbook with authentic Asian recipes. One of the first recipes I wanted to try was a Vietnamese one using oyster sauce and I was intrigued! The taste really pleasantly surprised me and its consistency helps to bring the whole dish together. It helps to make it one and also brings out the flavor of the meat even more. Say hello to this umami bomb! Over the years I changed, adapted and perfected that particular recipe. I’ve made this countless times and even the most skeptic eaters will love it! It’s perfectly balanced and gives you some REAL Asian flavor. Pineapple, bell peppers, onions, chicken, and crunchy cashews. Sweet, salty, slightly sour, but especially savory. Soft, creamy and crunchy. All the flavors you could ever want to be combined on a plate! Why order in when you got your personal number 34b without the MSG waiting right around in the kitchen within 10 minutes? Give it a try and overcome your oyster sauce fear! Roughly chop the white onion, finely chop the garlic, de-seed the bell peppers and dice into cubes, and slice up the spring onions. Cut the chicken fillet into cubes (about 2 by 2 cm). Put a large pan with a high rim on medium-high heat. Add 2 tablespoons of sunflower oil, the chopped white onion (not the spring onions! ), the chopped garlic and the chili. Stir-fry for about 5 minutes and transfer to a plate. Try to keep as much of the flavored oil in the pan as possible. Put your pan on high heat and brown the chicken pieces and the bell pepper. Depending on the size of your pan you might want to do this in 2 batches. Once the chicken and bell peppers are lightly browned, add the onion-garlic mix back into the pan. Reduce the heat to medium-high. Add the drained pineapple, the oyster sauce, the fish sauce, the brown sugar, and the cashew nuts. Stir-fry for another 3 minutes to make sure the chicken is cooked all the way through and everything is coated with the sauce. 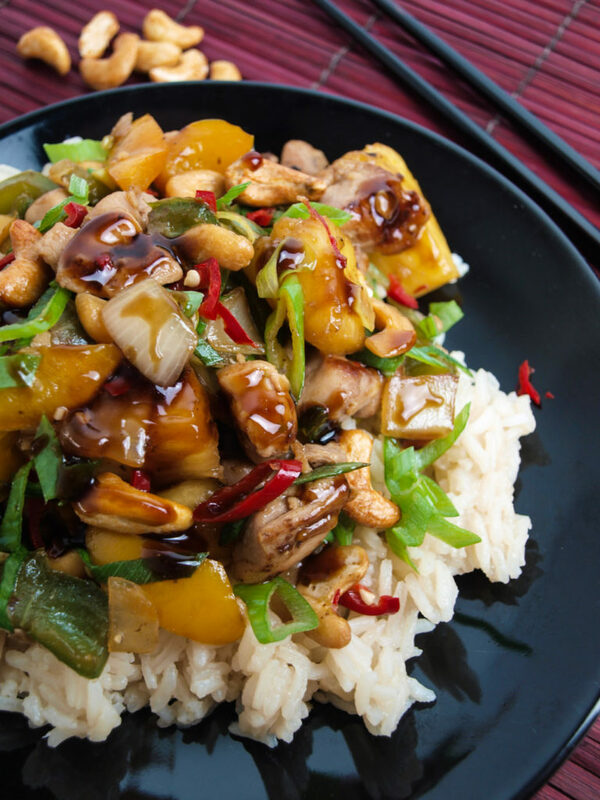 Garnish your tasty cashew chicken with the spring onions and serve with rice! Let me know in the comments what you think about this recipe! Did I promise too much? Does the oyster sauce taste like you expected it to taste? If you have any ideas on how to make this dish even tastier make sure to tell us here as well!